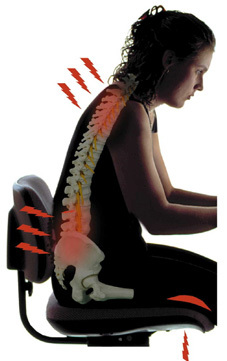 My head, neck and back aches haven’t solely been caused by poor posture whilst sitting at the computer writing, but I certainly could have prevented it getting so bad if I had taken regular breaks. Stress and tension on the body can also be felt if you are sitting there feeling like you need to get things done, rather than want to get things done. If it’s something you love doing and you are not coming up to a deadline, you are likely to feel more relaxed. Having a daily blog means that I don’t get a break – even for a day – so that’s one adjustment I will be making once my writing challenge has ended. Being a freelance writer by night, I have a day job too, where I also sit at the computer, so maybe publishing posts five days a week would be better, giving me the option of a day off every few days. Support your wrists when using the keyboard and mouse. Have the keyboard at a level where your elbow joint is at right angles. Your eyes should be looking straight to the middle of the screen, so that you don’t have to move your neck too far up or down to see the whole page. Have your knee joints at right angles (a foot rest is useful here; however, I’ve simply used a box this weekend). Support your back so that your spine is in alignment. Where I am still feeling the pain is in the cervical and also the thoratic sections of the spine (as I’m right-handed, I’m feeling this on the right). In summary, the cervical part of the spine is the vertebrae of the neck which is around 7 bones. The thoracic (consisting of 12 bones) is just below that which goes from the base of the neck to six inches above the waistline (source: Wikipedia and also the magazette I received from the chiropractor). I’ve also been told that sometimes the muscle strain and tightening can pull on the ribs as well, which is why some people experience pain in the chest as well as the back. I sometimes get a pain in the chest going from front to back which now makes sense. This has previously been diagnosed as indigestion. Uncorrected stress to the spine is called sublaxation degeneration and this is similar to osteoarthritis in the rest of the body. Mine is nothing like that and can be treated with chiropractor care, but in some people initial symptoms are ignored and this could lead to spinal decay and arthritis. I’m definitely going to look after myself better from now on and have regular checkups. The following website tells you a lot more www.backtalksystems.com. Vertebral subluxation is a term commonly used by chiropractors – as explained on Wikipedia. My headache has gone for now and my neck is starting to move more freely after the chiropractor made a few clicking adjustments yesterday; however, in order to keep it this way I’m being very careful with the way I sit, stand and I am also going to continue to do the exercises that the chiropractor has suggested. « Note 301 – Can changing titles make posts more popular?